On the court, not all players contribute to a team equally. Naturally, the best player(s) are going to have the most prominent roles offensively. The goal of a team offensively is to score as many points per possession as possible. Each shot taken has a risk and a reward. Essentially, the probability of the shot equaling or exceeding the team’s average offensive efficiency should be greater than the probability of it not. However, players have different talent levels. This contested shot is going to be more efficient than this contested shot because of the individuals who are shooting them. Depending on talent level, players can be more involved offensively than others and still be efficient enough to help their team. Finding this balance (between usage and efficiency) is key in maximizing a team. The below graph is of the most efficient players from 2009-2010. 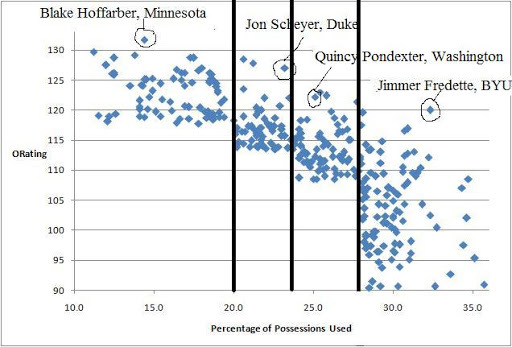 The x-axis is usage (% of possessions a player is used while on the court) and the y-axis is offensive rating. I circled four of the best players at each of the four levels of impact. There will be more on these four players and their respective regions on the graph later. It is interesting to compare the graph above to the NBA one. The stars in the NBA (high USG) are nearly as efficient as the top role players. This is very different from the NCAA. It is hard to tell why this is. Maybe NBA teams are better at recognizing who exactly should be taking varying shots on the court. Or maybe the stars in the NBA are just that much better at their craft.